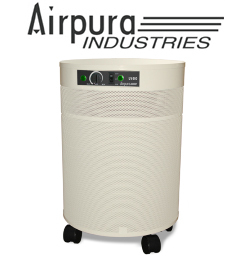 Featuring a 3 inch deep hospital-grade HEPA filter with 10 pleats per inch, for a massive 100 square foot surface area, the Airpura I-H600 was designed specifically for clinics, hospitals, and other health institutions, as a economical, yet highly effective particulate filter. The true medical-grade HEPA filter media traps 99.97% of particles .3 microns and larger, and roughly 95% of particles down to 0.1 microns, making it ideal for the removal of dust, pet dander, dust mites, pollen, mold spores, and other common allergens. The HEPA filter is warm rolled to reduce cracking at the folds and subsequent air leakage. The Airpura I-600 also includes a vacuumable pre-filter, and a 306 square inch Hi-C carbon weave filter to offer basic removal of airborne gases, chemicals, and suppress odors. An optional UV sterilizer for airborne bacteria, viruses, and other microorganisms is also available. The intense UV light penetrates the cell wall of the microorganism and destroys its DNA thereby rendering it incapable of causing illness. UV sterilization has many advantages over conventional methods of killing microbiological contaminants in that it is extremely effective, chemical free, produces no harmful bi-products, produces limited excess heat, is energy-efficient, is very easy to maintain, and is cost effective to both purchase and maintain. The "U" shaped UV lamp is roughly double the length of competitor's lamps, allowing for a much higher UV dose. The I-600 is equipped with a 560 cubic foot per minute variable-speed fan with a one-piece assembly to reduce vibration and noise, felt gaskets to prevent contaminant bypass (many competitors use rubber seals that off-gas VOCs), and an attractive powder-coated steel mesh housing with 360 degree intake. Recommended Application: The Airpura I-600 is recommended for hospitals, clinics, and other medical facilities requiring removal common airborne particulates such as dust, dust mites, mold spores, pollen, and pet dander, to relief allergy and asthma symptoms. When equipped with the optional UV sterilizer, the I-600 is also recommended for use in patient isolation rooms and for removal of airborne viruses and bacteria. 2-Year Parts, 5-year Labor Warranty! The Airpura I-600 has a 2 year parts replacement / 5 year labour warranty.